1000 H2 V-Twin 4-Stroke Engine w/EFI: The "H" in H2 engines stands for "hemispherical". The engine is built with a Pentroof Hemispherical Combustion Chamber, which provides the power advantages of the hemispherical design plus the efficiency advantages of 4 valves per cylinder. Wrapping 951cc of power and the efficiency, performance and consistent starting of EFI into one potent engine. 5-Link Rear Suspension: The 5-link rear suspension maintains tire geometry to keep the maximum tire patch on the ground for unsurpassed traction. Plus, it has maintenance-free bushings, Walker Evans shocks with 16-position compression and spring preload adjusters and industry-leading 18 inches of suspension travel. Digital/Analog Gauge: Switch between digital and analog modes displaying critical information indicators including speedometer, tachometer, clock, hour meter, fuel level, odometer/tripmeter, gear position, 2WD/4WD, front differential lock, battery condition, temperature and oil pressure. Duro Kaden Tires & Aluminum Wheels: Aluminum rims wrapped in Duro Kaden tires. 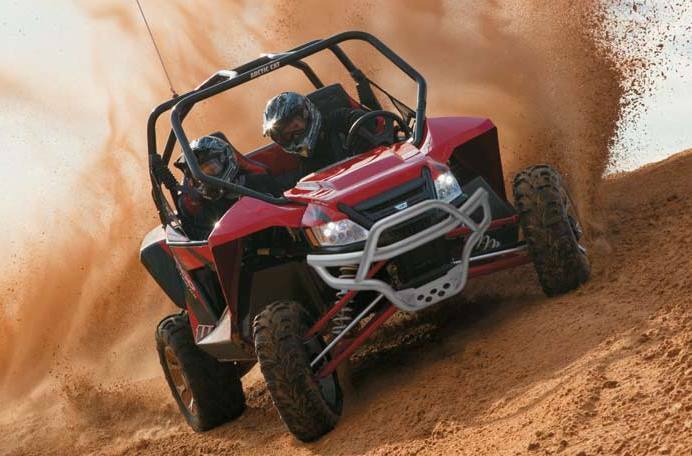 Duro Kaden tires give you traction anywhere this Wildcat can go. With 6-ply rated toughness and a specially designed tread pattern that channels dirt, mud and sand out and away. These tires give this cat the traction it needs to stretch its legs. Electronic Power Steering: Delivers a true variable assist system by measuring not only vehicle speed but also steering torque at both the steering wheel and the wheels. The electronic control unit measures input forces, resistance and speed, alerting the motor to deliver turning forces at predetermined levels. Adjustable Walker Evans Reservoir Shocks: The name Walker Evans is synonymous with off-road performance. These shocks with 16-position compression and spring preload adjusters live up to the name providing stability and longevity on any terrain. Pump 'em up for the off-road. Take 'em down for smooth trail riding. 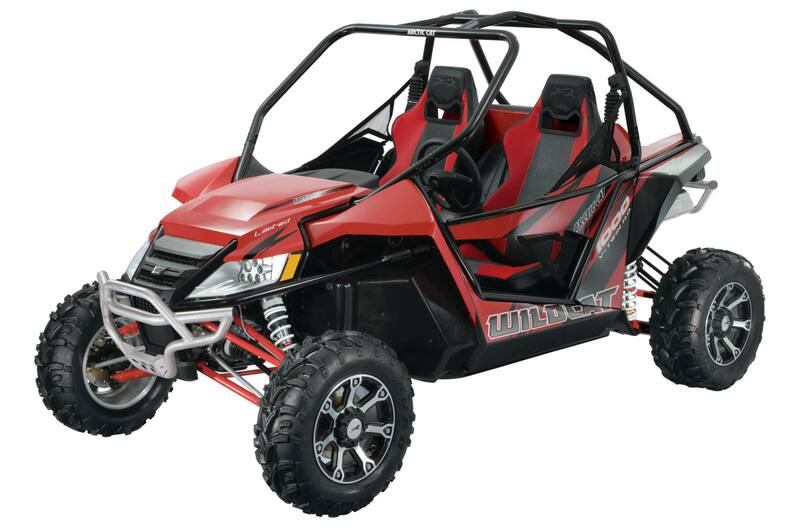 18 Inches of Rear Suspension Travel: 18 inches of rear suspension travel allows you to go almost anywhere - over almost anything. 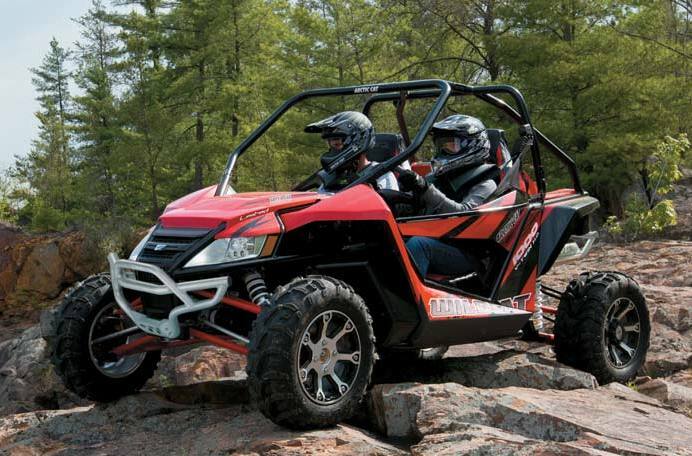 It provides a ultrasmooth ride over trail bumps and dips. 13 Inches of Ground Clearance: When you need to scale over downed trees, bound over boulders or go over dirt mounds, 13 inches of ground clearance is your best friend. Limited Paint Colors & Graphics: Standing out in a crowd is no problem with our automotive-style paint that comes standard on our limited models. And just because, we threw in special graphics to put that cherry on the top. Aluminum Bumpers: These aluminum bumpers are stylish, corrosion resistant, lightweight and provide added protection. The downside about these bumpers is that your buddies will only ever see the rear one. Rear Rack/Box Storage Capacity: 300 lb. The minimum operator age of this vehicle is 16 with a valid driver’s license.